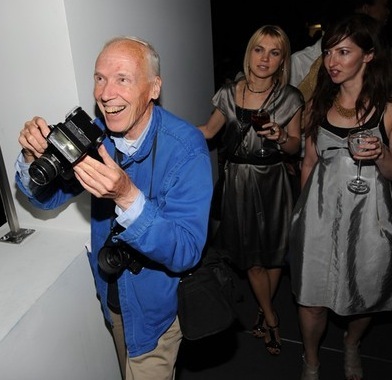 If you are a regular reader of the New York Times, especially the style section, you certainly know who Bill Cunningham is. He is the cheery looking man on a bicycle who photographs people. He loves people watching even more than I do. I was listening to his latest audio slideshow on the comfortable “American classic”, the cardigan, and its appearances everywhere in New York City (his forecast is that it is here to stay through the fall and winter months), and I got curious. I searched the NYTimes Web site and found this article about how he got his start. I also found this picture of him, most likely at some event, taking pictures of the fashionable and important in New York. I just love his photographs and his interpretation of the trends. His audio slideshows are so charming.